BRUSSELS – Serbian President Aleksandar Vučić had a meeting with President of Kosovo Hashim Thaçi, this morning in Brussels, hosted by the Federica Mogherini, High Representative for Foreign Affairs and Security Policy/Vice-President of the European Commission. “Both sides today agreed the final steps for the implementation of the Justice agreement reached within the EU facilitated Dialogue. The Presidents confirmed that the agreement will be fully implemented on 17 October 2017. On that day, Judges, Prosecutors and judicial staff will be integrated into the Kosovo Judiciary. 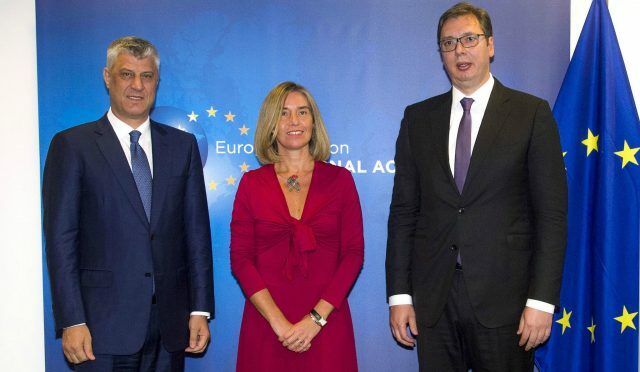 The integration of the judicial personnel will allow for justice to be delivered across Kosovo and, in particular, in Mitrovica region,” Mogherini said. Speaking for the media after the meeting, Thaçi and Vučić said that they have agreed on meeting more often in order to strike an agreement between the two countries. Commenting on the Serbia’s internal dialogue on Kosovo, Thaçi said that he doesn’t interfere in Serbia’s domestic debates, because Kosovo’s independence and its territorial integrity “are finalized and irreversible issues”. They followed up on their commitment from the last meeting on 3rd July where they agreed to start working on a new phase of the Dialogue between Belgrade and Pristina for normalisation of relations and reconciliation. Work on this will continue in the coming weeks. The High Representative welcomed the renewed commitment by both Presidents to the process. She reiterated that the EU and she personally is fully committed to the European Union perspective of Serbia, Kosovo and the entire region and that progress by both sides is firmly linked to progress in the Dialogue.